Some common questions about the Trello Connector. Which calendar services can I connect to Trello? We currently support Google (Gmail and G-Suite), Office 365, Microsoft Exchange, Outlook.com (prev Hotmail) and iCloud calendars. Unfortunately we're not able to support Sharepoint calendars or Outlook Desktop calendars. Make sure you have set up at least one sync rule for a board. You can do this by adding the Cronofy Power-Up to a Board and then clicking on the Cronofy button to define the sync settings. Alternatively you can login to the web application and create one or more sync rules there. Why are cards with due dates not creating events in my calendar? The most common reason for this is the sync rules defined for the board or organization are only for cards that are actually assigned to you. If you don't use assignment then the cards won't sync. 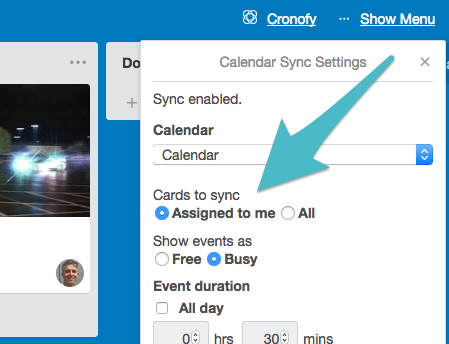 If you're using the Trello Power-Up, you can changed this on the Board sync settings. If you're using the web application you can unsync the Board and set it up again with it set to all cards to be synced. When I create an event in my calendar why does it not create a card in Trello? Currently the connector doesn't create cards in Trello when you create events in your calendar. We allow for two way sync of events created by the connector from cards with due dates. This is a feature that is on the list to be added. If you'd like to add your vote to this please email trello@cronofy.com and we'll keep you up to date on progress. Why are calendar events in strange time zones? Most of the time, we can work out your time zone when you connect your calendar. If we can't however, this will result in a default time zone being used. You can update your time zone in your Account Settings. How can I change the calendar account that I'm syncing with? You can manage the calendar accounts connected to Trello on the Account Settings page. If you're the owner of the subscription, you can cancel it on your Subscription page. Please email trello@cronofy.com with the email address of your Trello account and we'll help you. Things not working as you'd expect? Try our FAQs. Powered by Cronofy One API for all calendars.